This Popular Defense Brigade Flag is 140 cm. x 90 cm. or 55.11 in. x 35.42 in. It is made of a synthetic material with a fringe on three sides. Pictures show obverse and reverse of flag. Translation - Allah (God) loves those who fight in His cause as if they had a solid cemented structure. 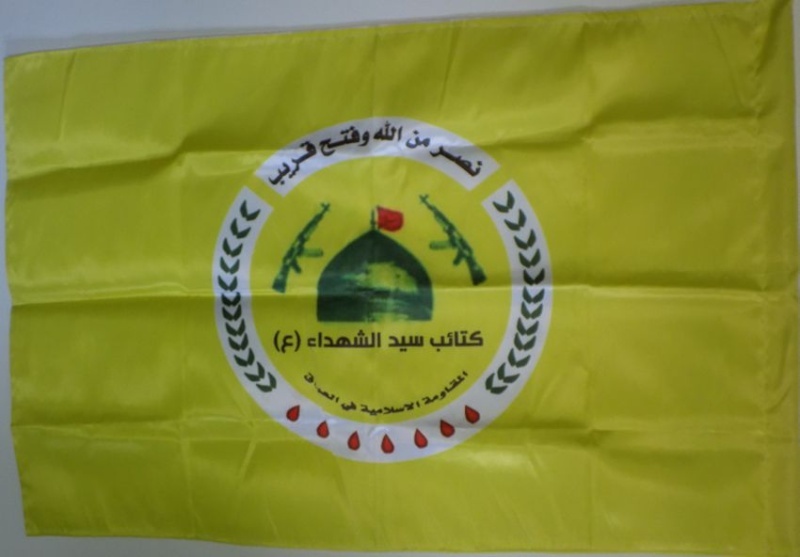 This League of the Righteous Flag is also 140 cm. x 90 cm. or 55.11 in. x 35.43 in. It is also made of a synthetic material and has fringe on three sides. The pictures show the obverse and reverse of flag. Translation - the boys believed in their Lord. 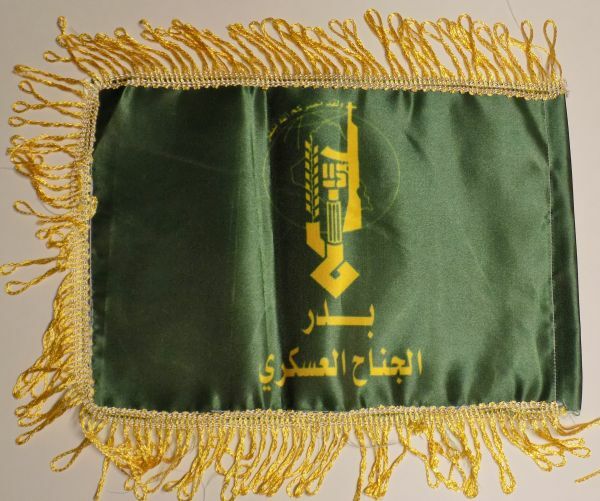 This is a neck scarf which is worn only by the heads of the Brigades in the militia. It is made of a synthetic material, 1.5 m. x 15 cm. or 59 in. x 6 in. (rounded off). It also has a fringe at the bottom of the scarf. It is printed the same on both sides. 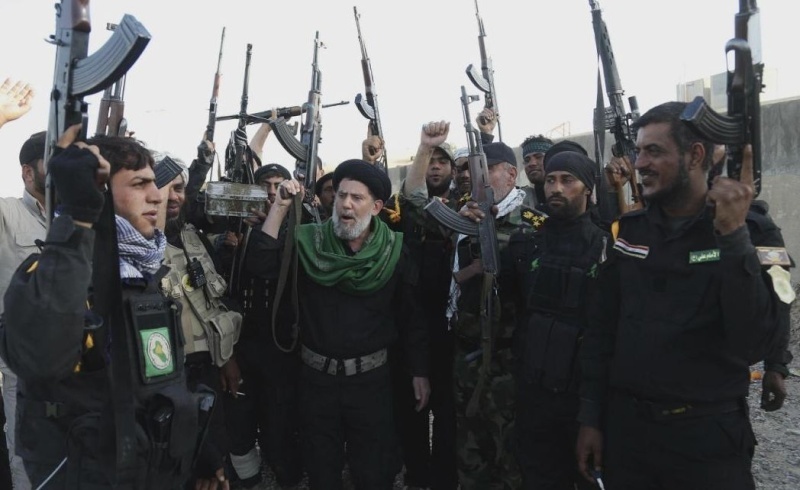 The person pictured is Mr. Sistani. 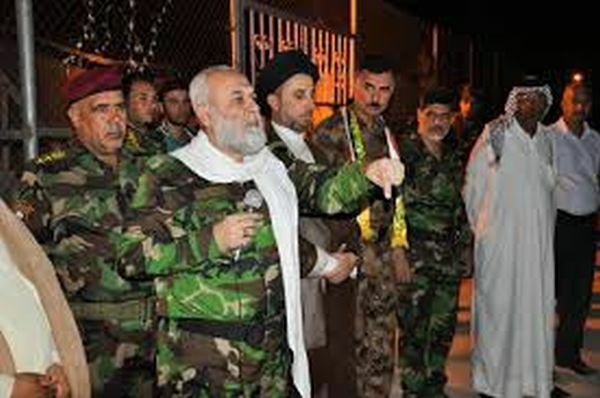 Translation - the Supreme authority in Najaf. A picture of a neck scarf in use. I didn't want to enlarge anymore as the picture is already grainy looking. The individual is to the right of center. Wow killer stuff Bob! Very nice indeed. 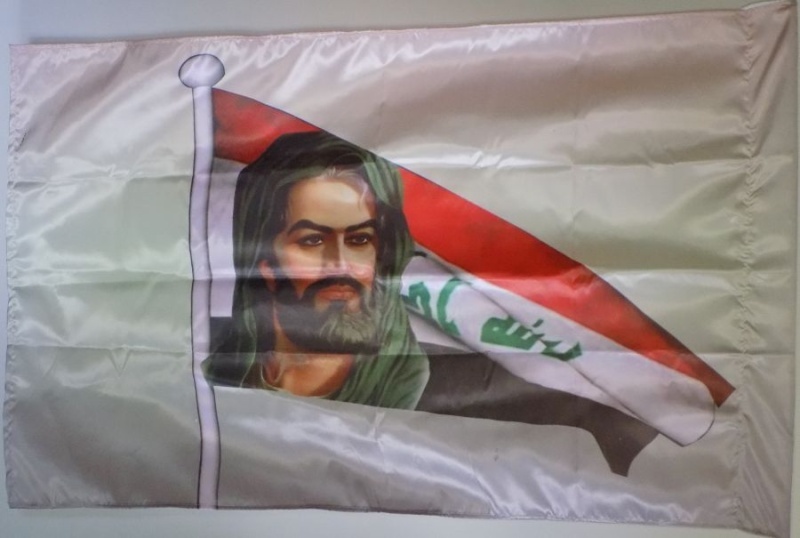 Your Iraqi collection never ceases to amaze me. Zeked wrote: Wow killer stuff Bob! Very nice indeed. 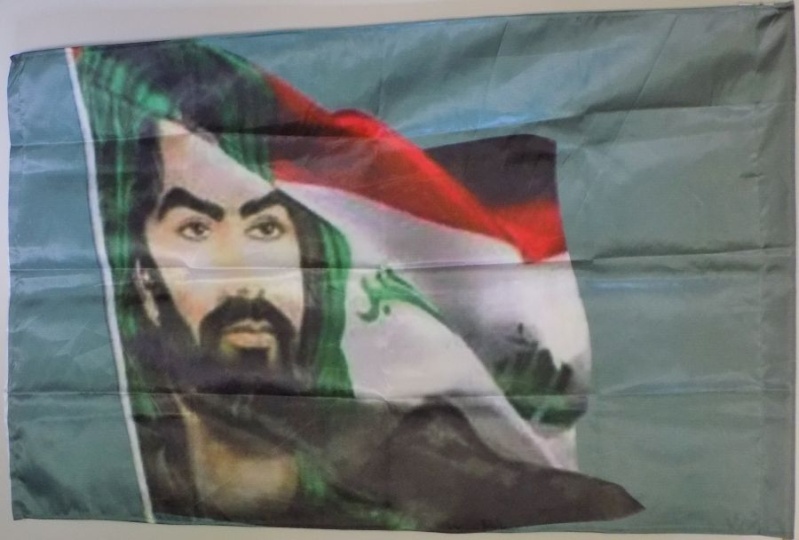 Your Iraqi collection never ceases to amaze me. These are the first I've seen of the new flags. There are all kinds of them for the different brigades. BM wrote: This Popular Defense Brigade Flag is 140 cm. x 90 cm. or 55.11 in. x 35.42 in. 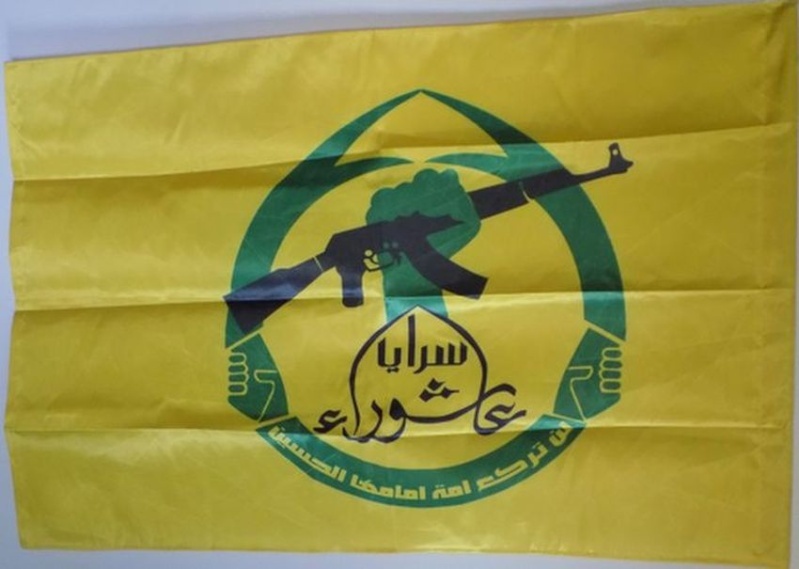 The flag is a flag of Shia militia ? 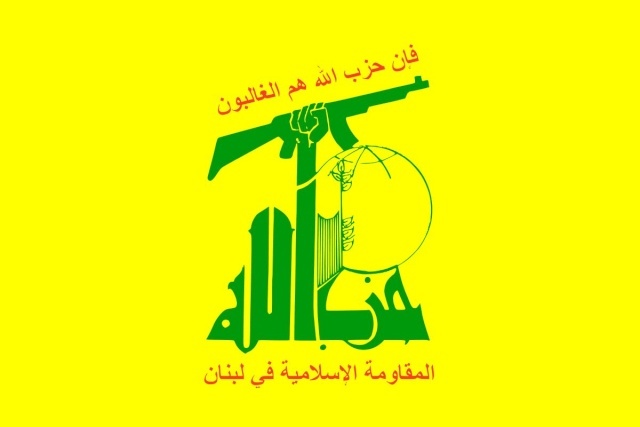 Hezbollah uses the same symbol. God I love it when people sign off with their names after posting. At least I know who I am talking to. 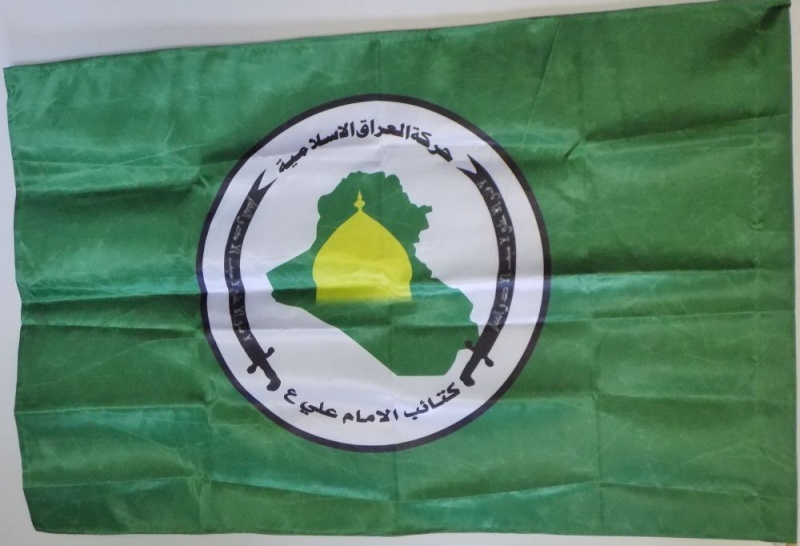 Yes, this is a flag of the Shia Militia. 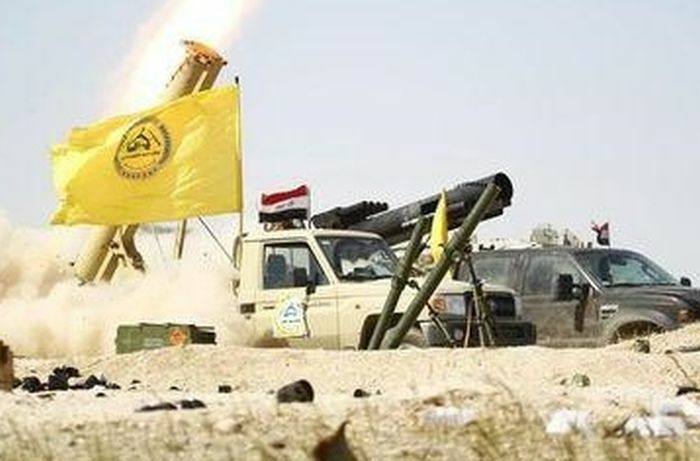 You will see the Hezbollah influence and Iranian influence in different flags. 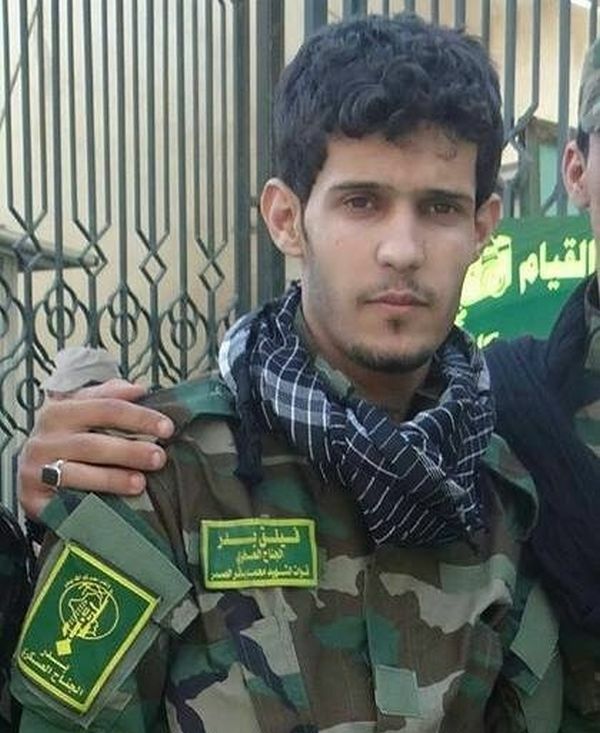 Hezbollah Battalions in Iraq and is lead by Abbas Muhammadawl. Thanks for the informations Bob ! 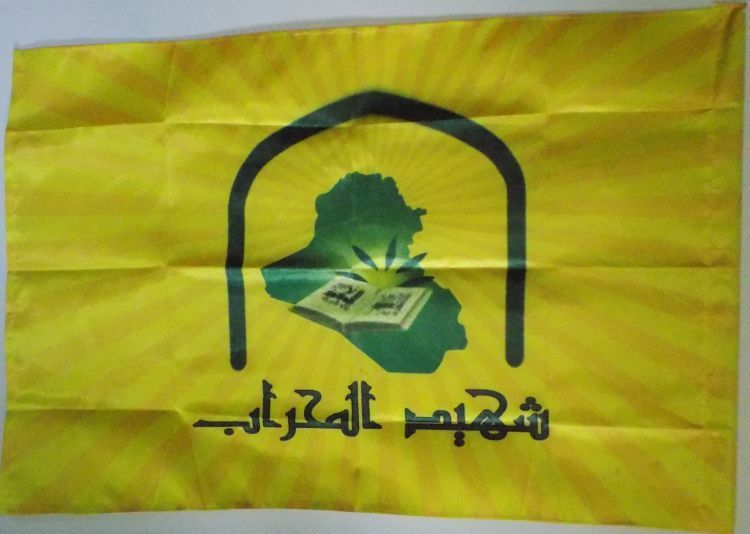 I have a Hezbollah flag from a US soldier veterans of Iraq war (from a grouping). Unfortunately I have no more info. A 53 inch wide by 34 in. 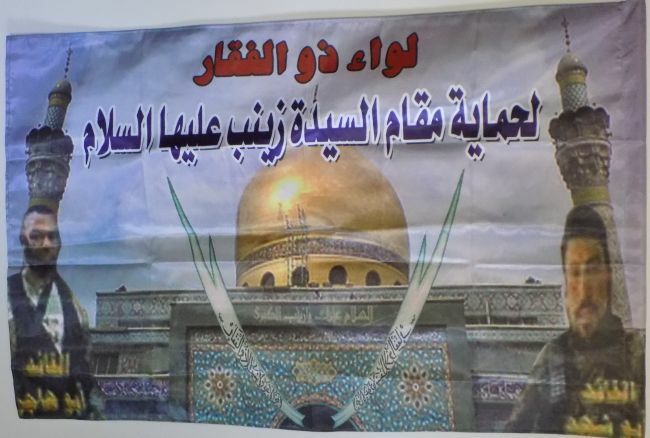 high banner for the Brigade of Imam Ali. This is a soft synthetic material. I have found three different types of banner (flag) material. Stiffer, more like rayon - soft material - and real soft like satin. 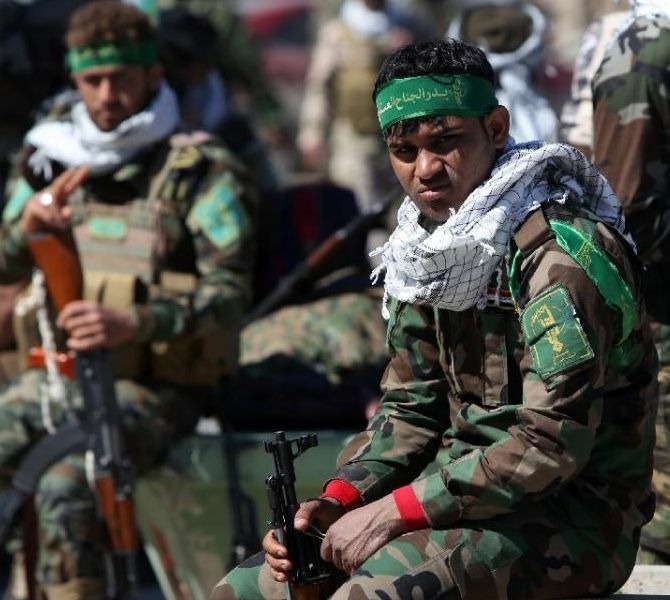 Inside sword - No boy like Imam Ali and no sword like the sword of Imam Ali (Zulfiqar). Zulfiqar is the sword name of Imam Ali. fringe. 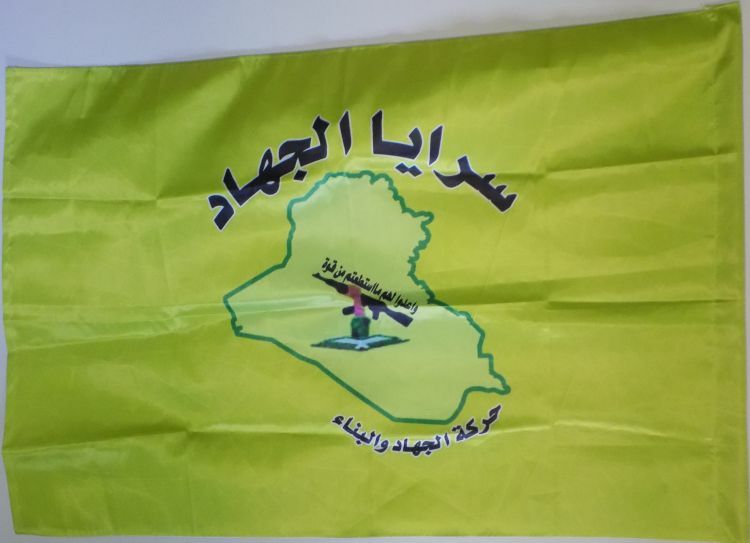 This is a two sided flag made of a soft synthetic material. Translation above - Fought the lords of disbelief. They do not have faith. usall wrote: Very nice ! I like it ! I'm glad you like them. 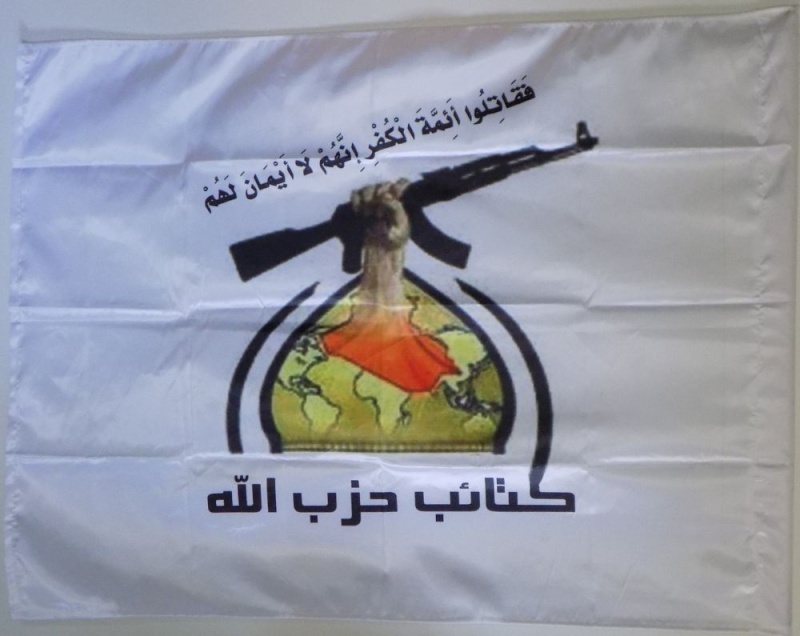 More to come..
Two banners for the Al Hussein Brigades. The first one is 54 inches long and 33 inches wide and made of a satin like material. The second one is 54-1/4 inches long, 33-1/2 inches wide and made of a synthetic material. 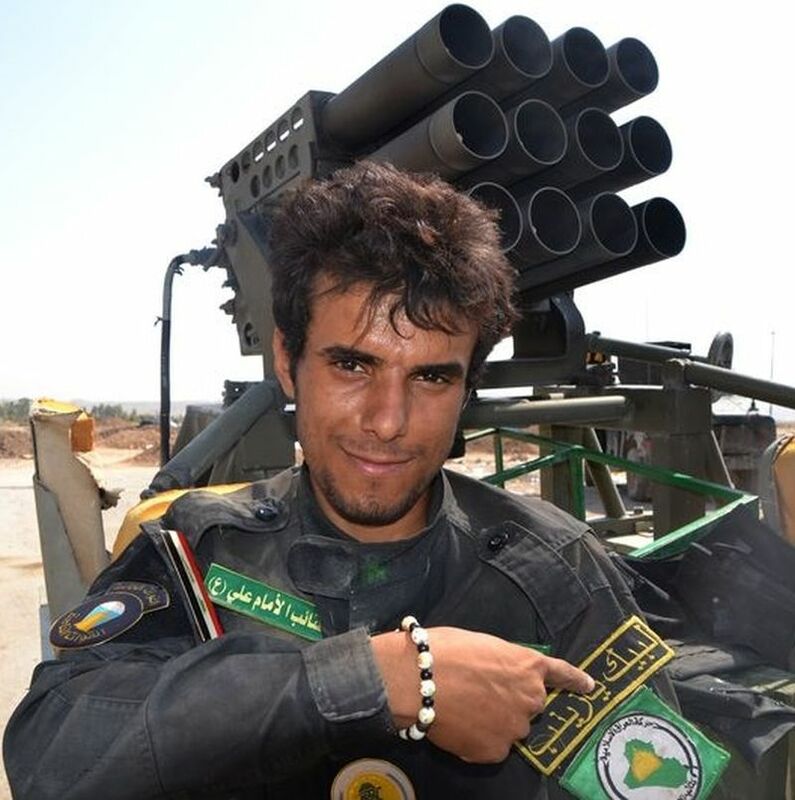 There are several different variations to the Al Hussein Brigades. I still have a few to go so keep looking. It's hard to get a decent picture of the larger size flags. still come out a little "off". I like the pictures with even borders all around. It's nice to see people sign their names after posting. At least I know who I'm talking to. 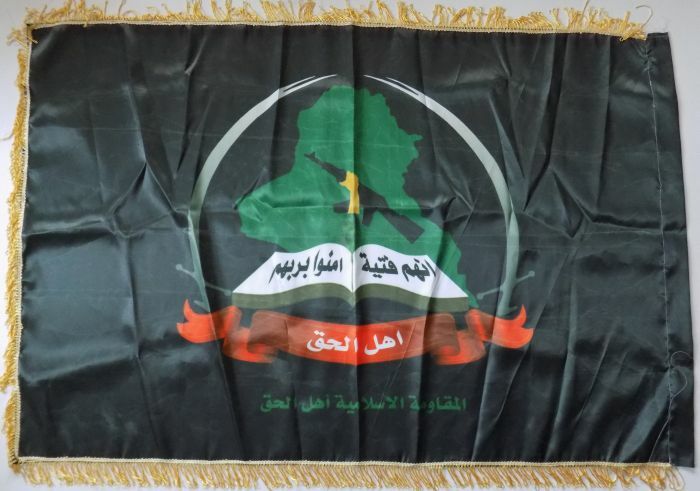 Abu Fadl Abbas Brigade Banner made of a satin like material which is 54 inches wide and 30-1/2 inches high. Translation above: the name of God Most Merciful. Bottom: Does not imagine who were killed for God are dead, but alive with a God and living. 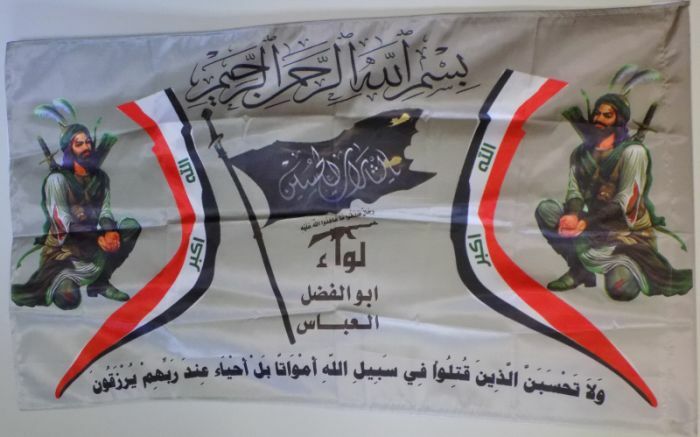 Brigade of al-Khorasani Banner, 51 x 33-3/4 inches and made of a soft synthetic material. 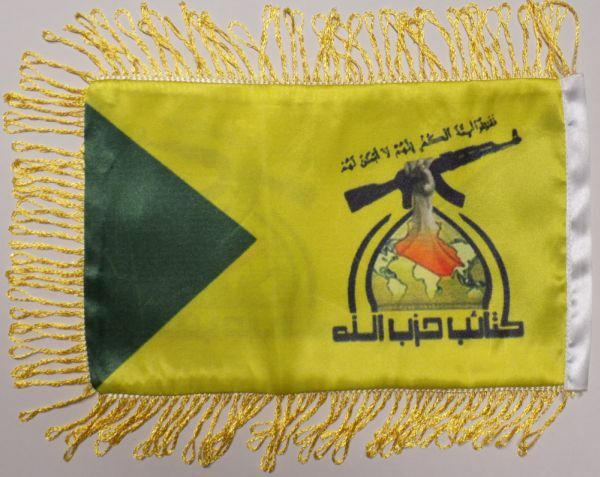 Ashura Brigades Banner, 51-1/2 x 34 inches high and made of a soft synthetic material. Bottom: This nation will not kneel and Hussein her master. 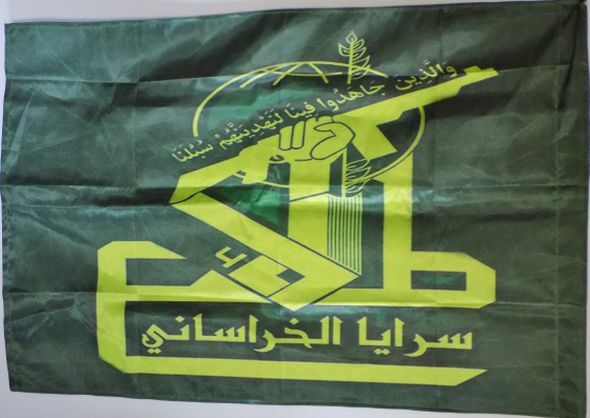 Zulficar Brigade Banner, 53-1/2 x 33-1/2 inches high and made from a soft synthetic material. 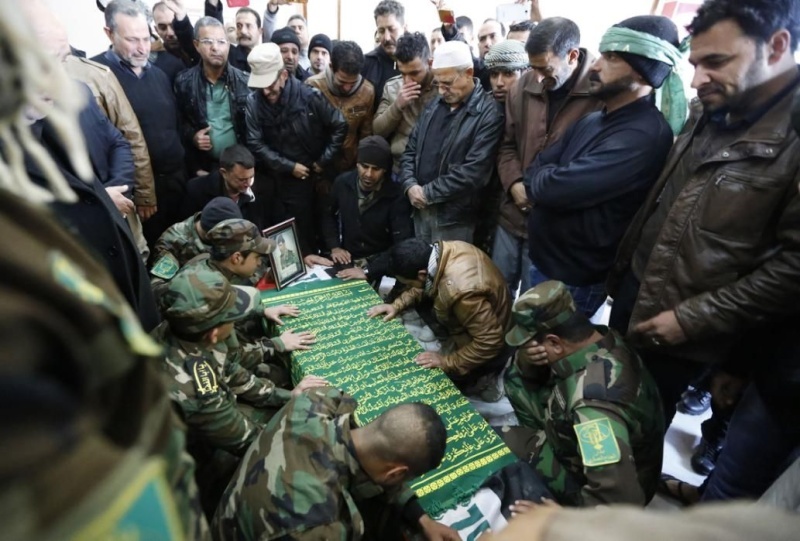 Below: Charge of the protection of the shrine of El Sayeda. Zeinab peace be upon her. 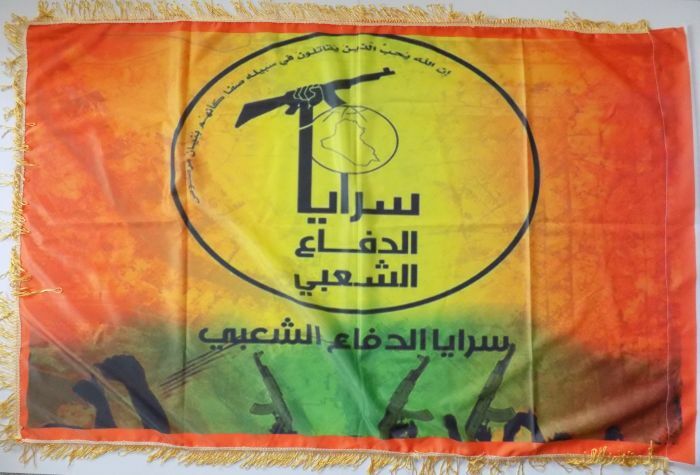 Banner for the Labored Brigade, 51-1/2 x 34-1/4 inches made of a soft synthetic material. 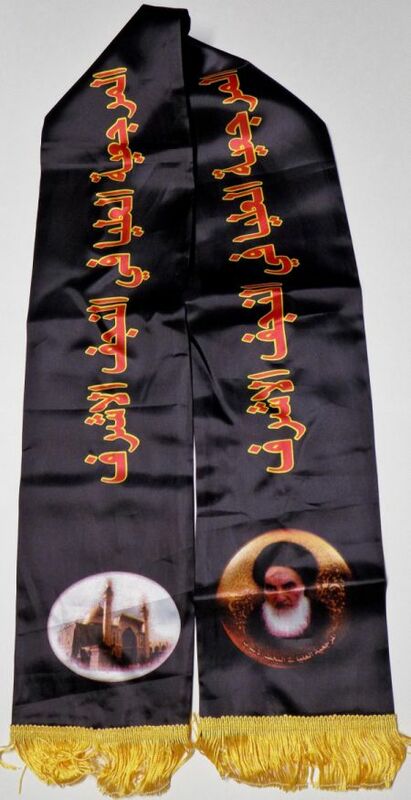 Banner for the Martyr Mehrab, 51-3/4 x 33-1/2 inches high and made of a soft synthetic material. 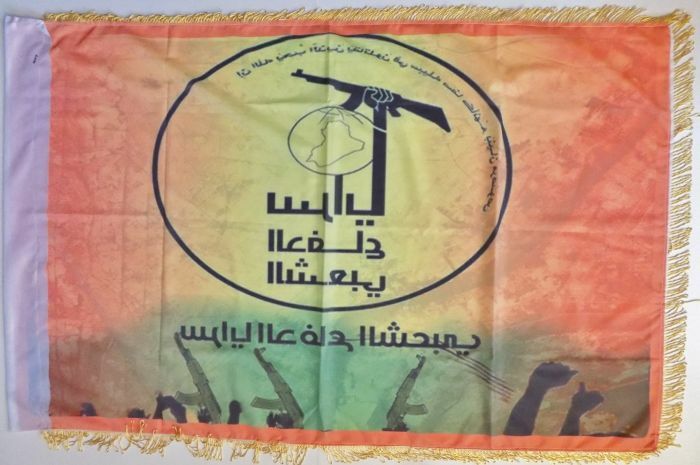 Banner for Martyrs Master Brigades, 53 x 34-1/4 inches high and made of a soft synthetic material. 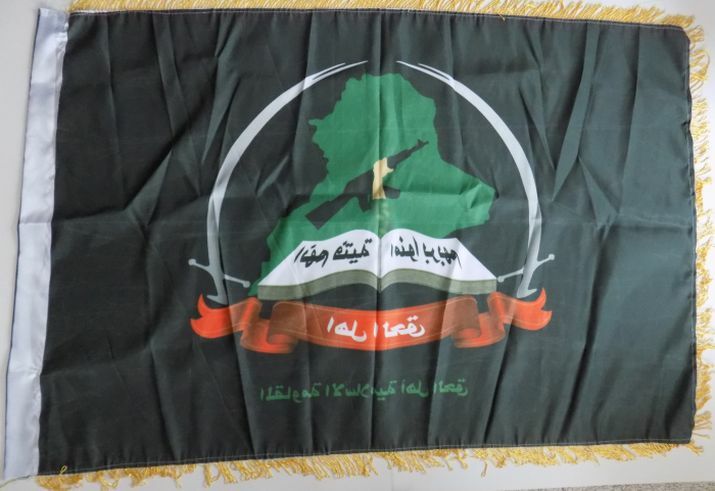 Table Flag for the Badr Military Wing, 11 x 7-3/4 inch high soft synthetic material. Glad you liked them. I haven't seen any around other than these.